Snapped this quick picture of this Ralph Lauren display in Dallas this past weekend. Love the white dishes, ruffled white linen napkins, and grey/silver taffeta tablecloth. 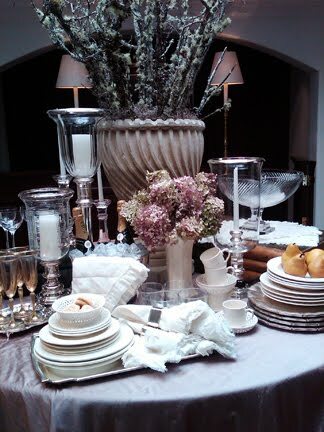 Notice the center antiqued urn filled with mossy branches and the dried hydrangeas tucked in the smaller vase. So beautiful yet somewhat simple? Wouldn't this look be beautiful for Christmas? It just needs some fresh cedar tucked in around the table! Spode Grove Your Only Chance!